The best-selling book The No. 1 Ladies' Detective Agency is to be made into a television series. Alexander McCall Smith's novel, which follows the adventures of detective Precious Ramotswe, is to be made into 13 episodes. 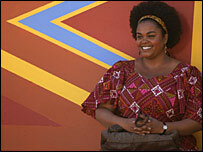 Singer and actress Jill Scott will star in the lead role. A 90-minute pilot directed by Anthony Minghella and co-written with Richard Curtis is to be screened on BBC One this Easter. Minghella is famed for winning an Oscar in 1996 for directing The English Patient, and he was also Oscar-nominated for writing the screenplay for 1999's The Talented Mr Ripley. Curtis has written screenplays for Bridget Jones's Diary and the sequel The Edge of Reason, Love Actually, Notting Hill and Four Weddings and a Funeral. He has also been behind TV series including Blackadder and The Vicar of Dibley. US television network HBO is partnering the BBC, which is part-funding it, to make the series. Filming will begin this summer. "Alexander McCall Smith's wonderful books have been a sensation around the world for years, and we're thrilled to be teaming up with the BBC to adapt these highly entertaining stories for HBO," said HBO's co-president, Richard Plepler. "And needless to say, the opportunity to work with the exceptionally gifted Anthony Minghella and Richard Curtis makes this project all the more exciting." Joining Jill Scott on the series will be Dreamgirls star Anika Noni Rose as Precious' highly-efficient, yet rather peculiar, secretary Mma Makutsi. It is not yet confirmed whether British actors Colin Salmon, David Oyelowo and Idris Elba who starred in the pilot, will return for the series. The No. 1 Ladies' Detective Agency chronicles the adventures of Precious Ramotswe, the proprietor of the only female-owned detective agency in Botswana. Aided by Mma Makutsi, Mma Ramotswe investigates cases, helps people solve problems in their lives, and begins a special friendship with the owner of a local garage. McCall Smith has had global success with the nine novels he has written about Mma Ramotswe.